A core part of the Sodashi ethos is our belief that your diet and lifestyle heavily contribute to the luminescence of your skin, and spring in your step! Whilst Sodashi products are made to provide nutrients for a healthy complexion, these effects are supercharged when complemented by a diet of superfoods, not to mention plenty of water! What top 5 foods would you recommend including in your diet to nurture the skin? I am a big believer that “beauty begins in the belly” – that gut health is paramount for healthy, radiant skin and overall wellbeing. Probiotic-rich foods like sauerkraut, for example, are rich in nutrients and probiotics to feed your skin from within as well as help to balance your gut health. Good gut health is imperative for beautiful, glowing skin as your gut is where 70% of your immune system lies, where we make nutrients and detoxifying enzymes, metabolise hormones and neutralise pathogens. Lacto-fermented foods are found in The Beauty Chef products and are also rich in bioavailable nutrients to feed the skin from within. Dark leafy greens, berries & pomegranate. These antioxidant-rich and anti-inflammatory foods are packed with nutrients to support collagen production, help protect the skin from UV stress and free radical damage, plus they also provide a good dose of fibre to help cleanse the bowel and detox the skin. For nourished, hydrated skin, consuming enough essential fatty acids is incredibly important. Foods rich in omega-3s – including flaxseeds, chia, salmon and sardines – moisturise and smooth the skin from the inside, out. Plus, they’re also super anti-inflammatory. All great sources of protein which is very important as it helps to repair and maintain healthy tissue and muscles as well as healthy hair, skin and nails. Protein also helps to keep blood sugar levels balanced, which is essential in terms of preventing glycation which damages collagen. Carrots, sweet potato and seaweed. 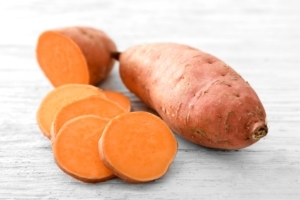 These foods are rich in beta-carotene, vitamin A, and help to rejuvenate the skin and promote cell turnover. 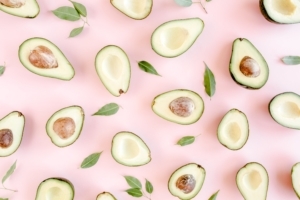 Avocado is also bursting with skin-boosting carotenoids and contains incredibly rejuvenating and moisturising good fats, which works to make the carotenoids more bioavailable for the skin to use as they are oil-soluble. Internal Beauty and health seem to be a huge focus for The Beauty Chef. How has your own health journey informed this ethos? As a child, I had eczema and when I was a teenager, I saw a naturopath who dramatically changed my diet. It had a profound impact on my skin so early on, I understood the intimate link between our gut health and skin health. Then, when my own daughter began suffering from similar skin issues, I decided to research what might be causing them. After delving into a number of studies that looked at what we eat and how food can affect the gut – and subsequently its effect on skin health – I put my family on a gut-healing protocol. Part of this protocol was the inclusion of probiotic-rich, lacto-fermented wholefoods and after including these foods regularly in the meals I cooked for my family, I noticed a profound difference in my daughter’s skin as well as an improvement in the well-being of the whole family. Through this experience, I began to understand the power of the gut/skin connection and began to experiment lacto-fermenting foods in my kitchen at home. This is essentially how GLOW, my first product, was created. As the brand has evolved, this philosophy that ‘beauty begins in the belly’ has remained at the centre of my work and informs everything we do at The Beauty Chef. Which foods would you recommend omitting from your diet in order to maintain a radiant complexion? For radiant skin, I recommend removing all packaged and processed foods from your diet and replacing them with low HI – low human intervention – foods instead. Processed foods are often loaded with refined sugars and additives that can be detrimental to our gut health as well as our skin health. In order to ensure sound mental health and wellbeing, which foods would you recommend as an essential part of a healthy diet? Studies show that consuming probiotic-rich, lacto-fermented wholefoods can influence both our mood and our general health and well-being by boosting the number and diversity of good bacteria in our gut. As our gut is also where our neurotransmitters and feel-good hormones such as serotonin are made, it is essential that we nourish ourselves with these foods not only so our skin glows, but so that we feel healthy, happy and vital. For someone embarking on a healthy eating journey, what key advice or message would you give them? Don’t diet – just eat! But eat the right foods. Healthy eating doesn’t need to be complicated so keep things simple and choose ingredients that are delicious and nourishing. Throw away processed foods and snacks and replace them with lots of wholesome, unrefined foods to nourish and love your body. By making simple dietary changes, such as avoiding refined white carbs, sugar, alcohol and sweets, should be very helpful. If you are eating good sources of healthy protein throughout the day as well as some healthy low GI carbs quinoa, sweet potato as well as your green veggies – you’ll have enough energy to exercise and power through your day without feeling lethargic. What is your go-to meal to brighten the skin? I’m a big fan of curries and I love slow-cooked soups and stews with lots of veggies and herbs and spices with bone broth. These are excellent beauty foods as they are easily digested and rich in nutrients as well as being very hydrating for the skin. I like to add loads of herbs and spices too for extra anti-inflammatory and antioxidant benefits. Which are your favourite Sodashi products? What is your wellbeing mantra? Look after your gut, be gutsy and follow your gut instinct! The Beauty Chef by Carla Oates is a lifestyle website focussed on promoting healthy eating practices for an optimum lifestyle and raising awareness on the link between sound gut health and beauty. Launched in 2009, The Beauty Chef has been a pioneering force in the philosophy of ‘beauty from the inside out’. Sodashi is proud to offer a FREE Glow Inner Beauty Powder from The Beauty Chef and a luscious 15ML Sodashi Recovery Skin Boost with every online purchase over $200! Stock’s limited. Promotion ends 27th July 2018! Find out more at www.thebeautychef.com.au.